Welcome to Blue Sky Expedition and hostel. 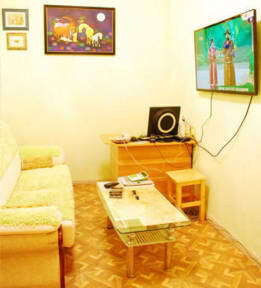 It is a comfortable full service hostel that is conveniently located in downtown Ulaanbaatar, Mongolia’s Capital City. Blue Sky Expedition features an experienced English and Japanese speaking staff, a central location, a warm atmosphere, kitchen facilities, exercise facilities and nature park just outside. TOURS desk and infermation ,Wi-Fi, luggage storage, free parking, visa and ticket services are also available. Shuttles to and from the train station and Chingis Khan International Airport as well as experienced Mongolian tour operators are provided to ease the stay. Great hostel ! The lady manager is really nice and helpful ! The tour that I had was also great (gorhki terelj national park) The driver was really kind and try to explain things in English. The nomandic family was really nice too. Blue Sky is a very good place. The guesthouse is very clean. Host are very nice and helpful. Unfortunatly I stayed only one night because there were not lot of guests and as a lonely traveller it was boring! Tres bon hostel, bien placé. La gérante est super sympa et ne pousse pas pour la vente de tours organisés comme les autres hostels. Seulement 2 dortoirs donc ambiance sympa et détendue. Seul soucis, l'approvisionnement en papier toilette est aléatoire et de temps en temps la personne qui devrait rester à l'hostel pour nous ouvrir, part faire des courses, on se retrouve alors coincé dedans ou dehors! À part ca, c'est très sympa!